New Jersey currently has over 39,000 miles of federal, state and local roadways, the 37th highest of the states and the District of Columbia. Motorists traveled 74.2 million miles on the state's roads in 2012, the 12th highest volume in the nation. State-owned highways and toll roads consist of 7% of road mileage and 66% of traffic volume. In contrast, county and municipal roads consist of 93% of road mileage and 34% of traffic volume. Motorists in New Jersey typically drive 8,299 miles a year, 18% below the average in the US. According to the New Jersey Motor Vehicle Commission, in 2016 there were about six million licensed drivers and five million registered motor vehicles in the state. The deteriorating condition of the state's roads and bridges and the depletion of state funds for construction, repair and maintenance emerged as a controversial political issue in the debate over financing the Transportation Trust Fund created in 1984. In the 2016 fiscal year ending June 30, 2016, the New Jersey Department of Transportation budgeted $323 million for roadways, most of which was for resurfacing, rehabilitation, and preservation projects and an additional $651 million for state and local bridges. The Fund was established to finance capital spending for roads and mass transit, with its revenues dedicated primarily from the proceeds of the gasoline tax and certain vehicle registration fees. Although the Fund had largely exhausted its available revenues by the beginning of the fiscal 2017 year on July 1, 2016, the Governor and the legislature were unable to develop a compromise to renew its financing, an impasse which continued into September 2016 as ongoing road projects were halted. One of the principal options for new transportation funding was to increase the state gasoline tax by 23 cents to 37 cents per gallon (going from second lowest in US at 14.5 cents behind only Alaska's 8 cents). Recent studies have pointed to the need for new investment to restore the condition of the state's aging transportation infrastructure. In a report released in July 2015 based on 2013 data, the US Department of Transportation found that two-thirds of the state's roads were in poor or mediocre condition and over a third of its bridges were structurally deficient. The Department estimated that deteriorated roads and bridges resulted in an average of $601 a year in added repair bills and operating costs to New Jersey motorists. Another study, by the consumer finance web bankrate.com, found that New Jersey's average automobile repair bill of $447 was the second highest in the nation, behind only the $451 in Delaware. 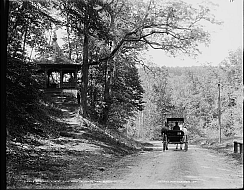 The New Jersey Department of Transportation was established by state law in 1966, succeeding the State Highway Department created in 1920 and assuming broader responsibilities beyond roadways to oversee other transportation modes. NJDOT presently operates, develops and maintains the public road system, including Interstate, State and Federal highways, with a total of 2,316.69 miles of NJDOT-owned and operated roads (as of July 2016). 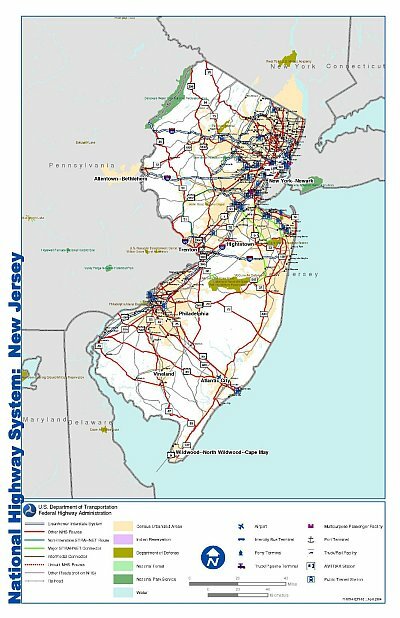 Most major highways including Interstate, US and state routes within New Jersey are under NJDOT jurisdiction. The New Jersey Turnpike Authority, which through legislation enacted in 2003 also operates the Garden State Parkway in addition to the Turnpike, is legally autonomous but its board is appointed by the governor, with recent governors designating the commissioner of NJDOT as the chair of the Authority board. The South Jersey Transportation Authority, which operates the Atlantic City Expressway along with other transportation services in South Jersey, has a board of comprised of the commissioner of the NJDOT; the commissioner of the state Department of Commerce, Energy and Economic Development; and seven members appointed by the Governor, who also appoints the board chairperson. The licensing of motorists and registration of motor vehicles, once a division of the NJDOT, was restructured in 2003 as the New Jersey Motor Vehicle Commission with an eight-member board, including the NJDOT commissioner. I-95 (enters New Jersey from New York on the George Washington Bridge and heads south on the New Jersey Turnpike until it becomes I-295 southbound as it passes through the interchange in Lawrence Township and crosses the Delaware River north of Trenton on the Scudder Mills Bridge into Pennsylvania). Perhaps the most significant gap in the interstate highway network is represented by the failure to complete I-95, the Atlantic Coast highway from Maine to Florida, through the state. 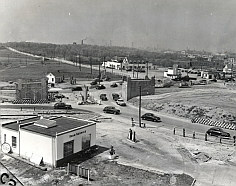 I-95 was initially planned as a new road to be built parallel and west of the New Jersey Turnpike, but opposition from the Turnpike, which feared the loss of toll revenues to a free highway alternative route, and protests from affluent communities north of Princeton which would have been impacted by its construction, resulted in the state terminating plans to complete I-95 in 1980, thus forcing motorists to use the Turnpike, US Routes 1 and 9 and other alternatives to travel from the New York City to Philadelphia metro regions. New Jersey's interstate highways are among those with the worst traffic and roughest pavement in the country, according to a report released in June 2016 by TRIP, a national transportation research group. New Jersey ranked third for the amount of urban interstate congestion, with 73% of those highways considered congested, and for where drivers experience traffic delays during peak commuting periods. The state ranked ninth for having 19% of interstate highway pavement rated in poor or mediocre condition, with Hawaii and California ranked numbers first and second of states with the worst pavement based on Federal Highway Administration data for 2014. The interstates carry an average traffic volume of 14,000 vehicles per mile each day, ranking it ninth for states with the most daily travel. The condition of the state's roads has also been cited as a factor in increasing costs for motorists. In a report released in July 2015 based on 2013 data, the US Department of Transportation estimated that deteriorated roads and bridges resulted in an average of $601 a year in added repair bills and operating costs to New Jersey motorists. Another study, by the consumer finance web bankrate.com, found that New Jersey's average automobile repair bill of $447 was the second highest in the nation, behind only the $451 in Delaware. In a national survey based on the most recent available data as of 2014, the consumer Web site Bankrate.com found that New Jersey was the fifth most expensive state for drivers, with an annual cost of $2,421 per year, 9% above the national average for car repairs, gasoline and insurance premiums. Comparatively low gasoline costs, however, have consistently ranked New Jersey as one of the cheapest of all states for fuel. Gas costs also have dropped sharply with the fall in the global price of oil; in fall 2015, some stations in New Jersey sold gas under $2 per gallon, compared to an average of $3.36 per gallon n 2013. New Jersey's major transportation connections to New York, Pennsylvania and Delaware also are under the jurisdiction of bi-state autonomous authorities created by a legislative compact between the states and approved by Congress. The largest of the authorities is the Port Authority of New York and New Jersey created in 1921, which owns and operates in New Jersey the George Washington Bridge, the Goethals Bridge, the Bayonne Bridge, the Outerbridge Crossing, the Lincoln and Holland Tunnels, Newark Liberty International Airport, and the PATH rapid transit system, along with port facilities in Port Newark and Elizabeth. The Delaware River Port Authority, a bi-state agency of Pennsylvania and New Jersey, operates in the Philadelphia-Camden metro region the Ben Franklin Bridge; Walt Whitman Bridge; Commodore Barry Bridge; Betsy Ross Bridge; and PATCO transit line. The Delaware River Joint Toll Bridge Commission operates 20 bridges--7 toll bridges and 13 free bridges--spanning the Upper Delaware between New Jersey and Pennsylvania. The Delaware River and Bay Authority focuses on transportation in the Delaware Bay and lower Delaware River, with its operation of the Delaware Memorial Bridge, Cape May-Lewes Ferry; Delaware City-Salem Ferry; and Millville and Cape May airports. The top three tolling agencies in the country are all in the New York-New Jersey region: the New Jersey Turnpike Authority; the Port Authority of New York and New Jersey; and the Metropolitan Transportation Authority. The three agencies together accounted for nearly a third of all tolls collected nationwide with a total of some $4 billion in 2013. According to a report published in January 2016 from the National Association of Insurance Commissioners using 2013 statistics (the latest data available), the average auto insurance expenditure of states and the District of Columbia was highest in New Jersey ($1,254.10), followed by the District of Columbia ($1,187.49); New York ($1,181.86); Louisiana ($1,146.29) and Florida ($1,143.83). From 2012 to 2013, the national average auto insurance expenditure rose 3.3% to $841.23 while New Jersey's grew by 2.8%. Among the nation's cities, average insurance premiums in Newark at $3,524 and Jersey City at $3,267 ranked, respectively, as the fourth and seventh highest of US cities. Another survey by Insure.com released in April 2015 reviewing average premiums in each state for the 20 best-selling cars in the US ranked New Jersey as the eleventh most expensive state in the nation with an average premium of $1,595, behind ninth-ranked California at $1,643 and top-ranked Michigan at $2,476. New Jersey car owners may choose between two types of auto insurance policies: basic or standard. The basic option is the cheapest car insurance, but offers limited coverage and is not offered by all insurance carriers. It provides 1) only $5,000 for property damage liability for damage an insured causes to other cars or property and 2) personal injury protection, regardless of who is at fault, of $15,000 per person, per accident for medical expenses for the insured, passengers and those given permission to drive the insured's car. Personal injury protection also covers the insured and the insured's family members if injured while riding in a car other than the insured's or if struck by another vehicle while on foot. Under basic coverage, there is an option to add $10,000 in bodily injury liability, but uninsured motorist coverage is not available. The insured's right to sue for pain and suffering is limited to severe or permanent injuries. The standard policy provides 1) bodily injury liability of at least $15,000 per person, up to $30,000 per accident up to policy limits, for injuries that others receive in an accident caused by the insured or other drivers listed on the policy; 2) property damage liability of at least $5,000 covering damage to another’s property and cars which may be increased at a higher premium; personal injury protection of $15,000 per person or accident which can be raised as high as $250,000; 3) uninsured and underinsured bodily injury motorist coverage equal to policy liability limits; and 4) underinsured motorist property damage of at least $5,000 covering damage to an insured's car when involved in an accident with a driver with insufficient coverage.Holders of a standard NJ auto insurance policy can choose between the limited right to sue and the unlimited right to sue. Under the unlimited option, the insured retains the right to sue for pain and suffering over any injury. With both the basic and standard car insurance policy, an insured's medical bills and lost wages are paid up to policy limits by personal injury protection coverage and then by any bodily injury liability claim or lawsuit brought against the at-fault driver. Regardless of the limit you have chosen, the policy will pay up to $250,000 for certain severe injuries, such as damage to the spinal cord or brain. Collision and comprehensive coverage can be added to either a basic or standard policy. Collision covers damage to an insured's car from an accident and comprehensive pays claims to replace stolen cars and for damages to a car from theft, fire, flood waters, hail, animal strikes, falling objects and vandalism. According to the Insurance Information Institute, the average annual cost for collision coverage in New Jersey was $356 and for comprehensive coverage was $118, according to the III. You have to choose a deductible if you buy comprehensive or collision coverage. A deductible is the amount deducted from any claim before a payment is made by the insurance company. Insurance premiums may be significantly affected by the insured's record of accident claims and driving violations. The average rate increase in New Jersey, for example, for a conviction for Driving Under the Influence is 85%, according to a CarInsurance.com report.